Historically, Texas A&M University (TAMU) in College Station, Texas, has been developed in two halves. The East Campus has been fully developed and used for classrooms, laboratories and dormitories, while the West Campus was designated for agriculture until recent growth. Now, impervious areas coupled with rapid growth has led to severe erosion along branches of White Creek. 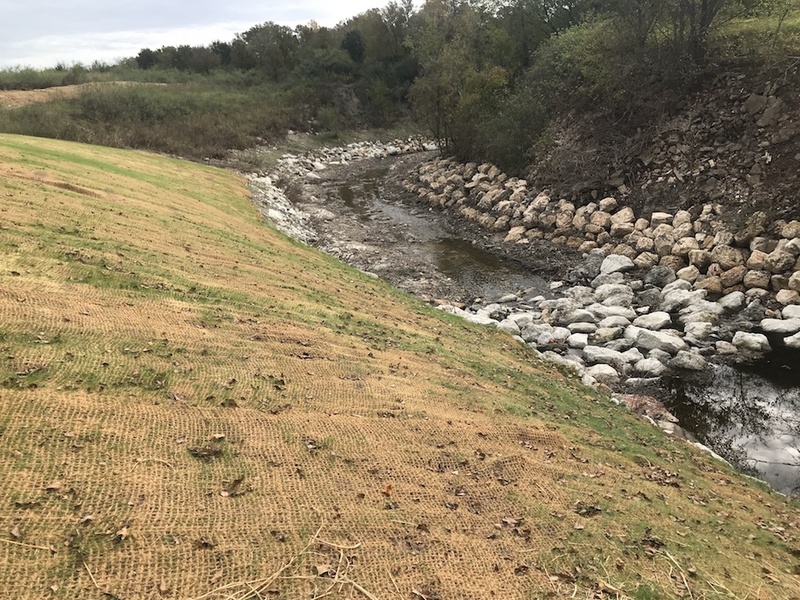 The Texas A&M Storm Drainage Mitigation project, scheduled to be completed in September 2019, seeks to reduce stressors on the more than four miles of impacted stream by working with the natural environment. While construction on the project recently began, the design will create five separate regional detention basins to reduce the most damaging storm flows. Large, longitudinal stone bank protections with bendway weirs will divert energy from outside bends toward the middle of the stream in order to ease erosion. Other stream stabilization measures include riprap armoring, engineered rock riffles, stone armoring and live stakes. In some areas, the erosion threatens structures, ponds and roadways. One example is that the stream bank supporting propane tanks at the Brayton Fire School has eroded to shear vertical escarpment. In response, the flow will be diverted from from the bank line and structural measures will construct a gentler slope. Similarly, at the George Bush Library, the hillside between the stream and roadway has been sliding, and erosion cuts into the embankment of the library pond. To combat the erosion near the library, the channel will be widened while longitudinal stone protection and live willow stakes will hold the slope. The extensive project with a 2,000 ft reach was made possible by close collaboration throughout the planning and design processes between diverse partners, including TAMU Utilities and Energy Services, the Office of University Architect, the Environmental Health and Safety Office, TAMU Extension Service (TEEX), the George Bush Presidential Library, the Texas Department of Transportation, the TAMU AgriLife Extension, the Facilities Planning and Construction, Stanley Consultants and regulatory agencies. “The collaboration was constant, open and contemplative, as all parties cherished the natural condition of the stream and worked to find ways to enhance and protect it,” Miller said. Beyond mitigation erosion risks, the project will restore White Creek and create a community asset through prairie plantings, trails and pedestrian bridges. The natural area this project preserves along White Creek will provide generations of students an example of sustainable design, while addressing erosion issues spurred by the rapid development. If the project is met with enthusiasm, there are additional miles of the stream that could be enhanced and connected by trails, Miller said.